My Friend and Hyper-V MVP college Didier Van Hoye (also known as @WorkingHardInIT) and I (known as @hypervserver) had a creasy idea: doing a Showcase and here comes the problem: in English. 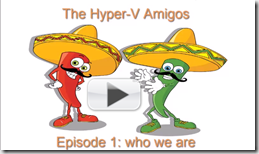 So we did our first Episode of “The Hyper-V Amigos” Showcase where we talk about “how we are” and “how we “stranded in IT”. I hope you have the same fun watching the video than we had recording it. P.S. : The Intro is spoken by another MVP Kerstin Rachfahl. Unfortunately she is not a Hyper-V MVP but you can’t have everything (and I love here anyway).